April 7, 2013 - The Radio Go Box bug hit me this month and I decided to put an HF version together. A Go Box is a complete, self-sustained radio station in a box. In this case, it is for Amateur Radio. I had a few considerations going into this project. One was weight. In the past I have used a very strong and large backpack as a way to carry my HF radio equipment from my home to Central Park. A backpack has no wheels, so I must carry all the equipment and their weight on my back. Much like HFPackers do. Backpacks have another disadvantage, their different pockets make the radio equipment hard to assemble ahead of time. So I’ve had to take the equipment out and connect all the different parts while out in public. This is time consuming and can frightening onlookers (wires, batteries, black boxes ), think about it. And New York City is paranoid enough even 12 years after September 11, 2001. [Note: links to photos appear at the end of this article]. I am using my Yaesu FT-857D because it can output 100 watts on HF. I did not wish to be limited by the low power of a radio like the Yaesu FT-817. I can always lower the FT-857D’s power if I wish to work QRP. The down side of using a full 100 watts is needing batteries that can give you that much power. And that means weight or money (if one wishes to use Lithium Ion batteries). I am using a the MFJ-901B manual antenna tuner until I can purchase a small LDG auto-tuner. I am using the LDG FT-Meter LDG meter which works with both the Yaesu FT-857D and FT-897D. The meter is bigger than the meter which comes with the FT-857D. The UB12220 22ah Gel Cells work well, but weighs 14lbs each. They measure close to 7 X 7 X 4 inches. The Pelican case is strong, top fed and weighs 16lbs. Total weight for all the equipment is a little over 50lbs. I know, it seems like much, but the Pelican case has wheels which makes it easier to transport the radio equipment. It is tough getting that fully loaded case up and down house and subway stairs. I also discovered that the Pelican 1440 case’s lid does not open more than 90 degrees. So standing up, the lid stays in a vertical position and is very much in the way. After purchasing the Pelican 1440NF case (NF means No Foam Inserts) it was time to do some measuring of the inside of the case. The case is 14 inches deep and measures 17 X 7.5 at the bottom. I had to make a wooden platform on which to put the radio, meter and antenna tuner. A trip to the local hardware store and I was a proud owner of two 14 X 17’ 1/2” plywood pieces. At this stage is was prudent to lay the radio, meter and antenna tuner on top of the plywood to see how fit. All was well. I covered the wood in black contact paper. I have never painted a thing in my life, and this was no time to start. I then added two legs to the platform for the front and a long strip of wood in the back. These ‘legs’ lifted the plywood 4 inches. The four inches needed to place the batteries underneath the plywood platform. After some careful measurement, I screwed the Yaesu FT-857D mobile mount bracket into the contact papered plywood. Then the Velcrod the LDG Meter and the MFJ antenna tuner to the plywood. I then connected the antenna tuner to the radio using a short piece of coax. The LDG FT-Meter connects to the FT-857D via a small jack underneath, near where the microphone enters the unit. I then connected the batteries together in parallel (to increase amp hours, but keep the same voltage). And then connected the batteries to the radio via Anderson Power Poles. It was dark by this time so I had to wait till the next day to take the Go Box out for a test. The next afternoon, took the Go Box outside, to the stoop of my apartment building to test it. Almost immediately the Go Box began teaching me a few things about itself. It was heavy!! I live in a three family apartment building with no elevator. So I had to carry over 50 lbs of weight down three flights of stairs. Upon getting to the top step of the stoop I laid the case down horizontally, opened the lid and tried to turn the radio out. Nothing…... The wires to the batteries had disconnected by coming loose. And one of the Power Poles was way ahead of its partner, mis aligned. I fixed both issues and the radio turned on. For this test I used my trusty Buddistick antenna. I tuned around 20 meter band and heard some stations. I tried tuning the radio on AM but could not lower the SWR no matter what I tried. I tried for quite a while, seeing random high and low SWR readings After trying for a while I packed it all up and headed back upstairs. I later learned that the coax connection to the antenna tuner and the radio were not as tight as they should have been. Moving the Pelican 1440 case up and down the stairs with the two 14lbs batteries inside was a pain and not good for my back. What I will probably do in the future is put the batteries in a backpack and leave the radio, meter and antenna tuner in the case. The case is easier to transport this way. At least until I reached the street level. Once at street level (if no trains or buses are need to travel) then the batteries can be placed inside the case for an easy wheeled ride to my destination. At about this time, I can hear all those FT-817 enthusiast saying “told you so, you should’ve used an 817”. But I prefer being heard and am willing to pay the price for more power. I also learned that the Pelican 1440 case has a lid which is very much in the way. In speaking to Pelican, they said it is ok and will not void their lifetime guarantee if I remove the pins that hold the lid to the case. 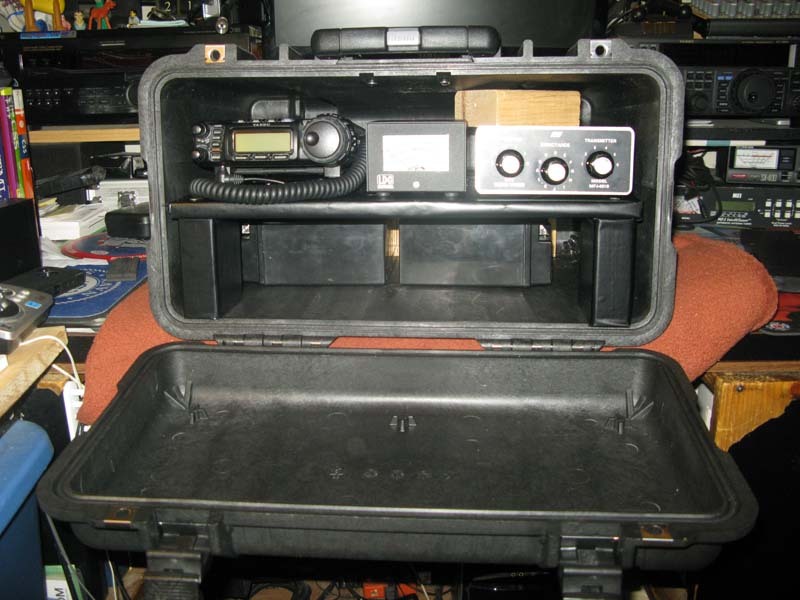 I may do that, but for now I prefer to lay the case horizontally and use the lid to hold light items, like the microphone when in use and my HF log book. The case can be used in a standing up (vertical) position. But for horizontal use I see that it will need a strong table on which to rest it (something else to buy). A table will add more weight to this endeavor and a table demands a chair. Oh boy.. For those thinking, ‘what about using a car to move all that equipment around”. I do not own a car. You don’t need one in New York City. We use public transportation and the money saved in car payments, insurance and gas is spent on purchasing ham equipment. The next lesson learned was one of preparedness. Checking coax and dc wire connections before closing the lid and leaving the house is a must. Last, but not least, ensure that the antenna being used will work well for HF. The Buddistick did work well, but I have to find a way to better secure its clamp to the metal railings found in Central Park and all around the city. The next article will cover using the Radio Go Box out in the field. The links below direct you to my photo gallery. Enjoy!